The Alpen Village Hotel is an alpine style three star hotel set in a quiet location in Livigno, only a 3-minute walk from the nearest lift. 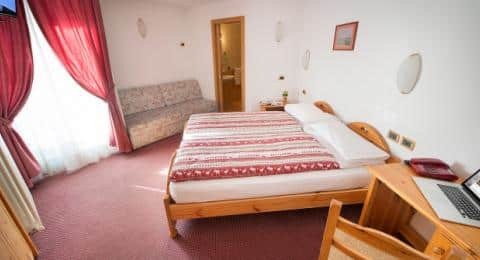 The experienced Galli family have recently taken over the management of the Alpen Village Hotel, offering excellent friendly service. The complex comprises of a central building where you will find the reception, a welcoming bar with an open fire, a restaurant with terrace and a quiet lounge, and seven connected chalets where you will find the bedrooms. The hotel is only a 4 minute walk to the ski lifts. The restaurant offers a wide selection of cuisine including Italian specialities as well as typical dishes from Valtellina and Livigno. The hotel also caters very well for guests with food intolerances. The hotel offers a wonderful wine selection from Bivio’s wine cellar as they have 200 types of Italian & international wines, so lots of choice! Bedrooms are casually decorated and feature flat-screen tv’s and free Wi-Fi; some rooms have balconies. For your convenience room service is available. Other amenities include a spa area with an indoor pool, outdoor hot tubs, a fitness room and sauna, ideal to wind down after a day on the slopes.